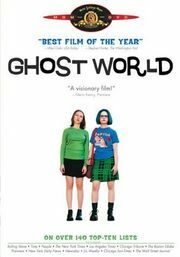 Before "Art School Confidential" Director Terry Zwigoff adapted another one of Daniel Clowes graphic novels, the satirical "Ghost World". About longtime friends Enid and Rebecca as the graduate high school and try to decide what to make of their lives. The story focuses more on Enid, played by Thora Birch, and her quest to find herself. Her mother is no longer around and she lives with her very conservative and nerdish father. They have an average relationship as he is oblivious to her problems and she just kind of puts up with him until she can move out. All of the characters in "Ghost World" are a bit quirky, to say the least, but they are very real and relatable. Enid and Rebecca wander their small town spouting out various opinions and random thoughts. They pass by Norman, the old guy who is always sitting on a bus bench waiting for a bus that never comes. They visit the sidewinder convenience store to pester and torment their friend Josh (Brad Renfro, R.I.P. ), then end up at a 50s diner called Wowsville. While reading the "missed connections" section of the local paper and laughing at all the losers they decide to call one of the numbers and leave a message. This brings us to another eccentric but down to earth character in Seymour, played perfectly by Steve Buscemi. Seymour is a single middle-aged "sad sack" kind of guy who says " He has difficulty relating to 90% of humanity" He has extensive knowledge and collection of old 78 records. He is a guy who seems to have been born a few decades too late. The Girls set up a blind date with Seymour just get a look at him and to observe him. Enid always carries around her sketchbook and fills it with drawings of all the weird people she comes in contact with. After they stand up Seymour at the cafe they unexpectedly run into him at a sort of garage sale/swap meet. Enid finds him fascinating and buys a record from him. Enid and Seymour then develop this friendship based on old jazz musicians and the fact that Enid wants to find him a girlfriend. They are both lonely souls in a world of people they can't stand to be around. Rebecca, on the other hand, is the more "normal" of the girls, she works at a coffee shop and is pretty put together. She doesn't understand Enid's fascination with Seymour and they start to drift apart as friends. They always dreamed of getting their own apartment together, but now that the time has come, they keep drifting further and further apart. The ending is very hopeful but uncertain. It remains true to life and doesn't give any easy answers. Difficult decisions have to be made whether we like it or not. Some would call it living your life.